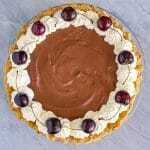 Black Forest Pie. An easy to make creamy chocolatey and very slightly boozy version of the classic dessert gateau, in pie form! You can make it in an alcohol-free version too. 1/4 cup ice water. Adding only enough to make a dough form. First marinate the cherries in the cherry brandy overnight. Drain off the cherries but don't discard the brandy. Use this to create a cocktail, to add to something like our Chocolate Strawberry trifle or to add to a pitcher of Sangria. Of course you can omit the brandy altogether for an alcohol free version of this pie. Using a food processor or a pastry blender cut cold butter into flour and salt until mixture resembles a coarse meal. Small pieces of butter should still be visible. Pour cold water over the mixture and work in by tossing with a fork until dough begins to form. Use your hands as little as possible and work the dough as little as possible. Divide dough into 2 balls, flatten into 2 rounds, wrap in plastic wrap and place in the refrigerator to rest for a minimum of 20 minutes. You can freeze the second round for another time. You can make your dough the previous day but make sure you take it out of the fridge for 10 -20 minutes to warm slightly before rolling out. Roll the dough into a 12 inch round and place in the bottom of a large 10 inch pie plate, preferably a deep dish pie plate. Trim and flute the edges as desired. Poke a few holes in the bottom of the pastry shell, rest in the refrigerator for an additional 20 minutes before baking at 400 degrees F for 12 – 15 minutes or until golden brown. I prefer to blind bake this pastry shell to prevent shrinkage. To do so line the pastry shell with aluminum foil or parchment paper and fill with baking weights or dried beans used as baking weights. Bake for 10 minutes then remove the weights and finish baking until golden brown. Cool completely before adding the filling. In a double boiler, melt the chocolate chips together with 3/4 cup of the whipping cream. Stir constantly as you melt the chocolate and don't let it overheat. As soon as the last of the chocolate melts, take it immediately off the heat and let it cool down to lukewarm. Whip the remaining 3 1/4 cups cream with the icing sugar and vanilla to firm peaks. Remove roughly 1/3 of the whipped cream to a small bowl and reserve it to top the pie at the end. Fold in the melted chocolate by hand into the remaining, larger portion of the whipped cream. Be as gentle as you can so as not to deflate the cream. Spoon half of the chocolate mixture into the baked pie shell and level it out. Add the cherries on their sides, not with the holes from pitting sticking up. This makes for a better looking presentation when cut. Add the second half of the chocolate mixture to the pie and level that off as well. Finally garnish with the reserved whipped cream around the edge of the pie. Please note that this is a large pie meant to feed 10 or more people. I have a large deep 10 inch pie plate that I use for pies like these. If using shallower 8 or 9 inch pans, you will get 2 pies from this recipe. You may need to soak a few more cherries too. Just line the bottoms of the two pans with a single layer of cherries before starting the pie. This will tell you exactly how many you will need.